Sometimes you have to give credit where credit is due. An old elementary, middle school, high school friend, and a great friend to this day, starting making this pizza way back when. I stole it from her. Us girls would always request it, and for some reason I specifically remember her bringing it to the lake. We'd take a couple days and all head out to our friend's cabin on the lake by our hometown. Those were the days - skiing, paddle boating - and trying to "paddle boat" our way around the lake. But, we would never leave a crumb of this dessert at that cabin. You know, desserts are meant to be eaten up, right? 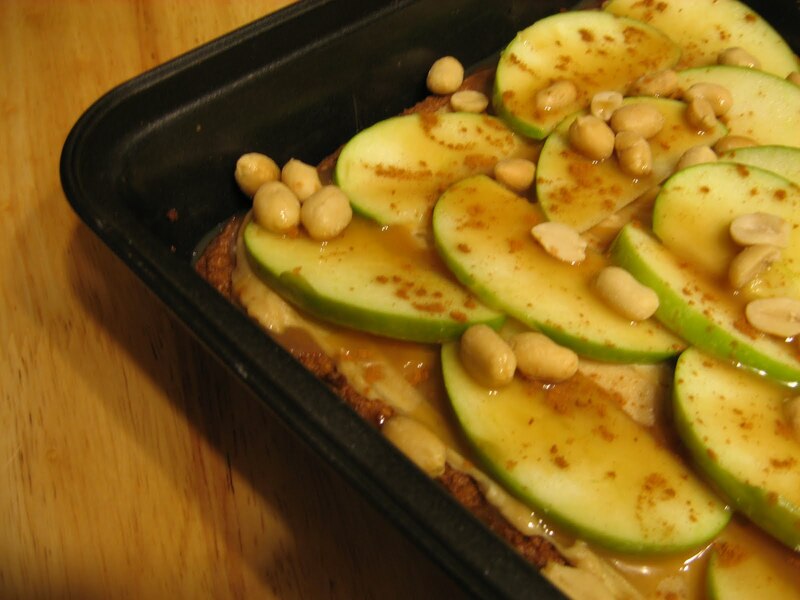 Mix ingredients for the crust and press down in a 9x13 pan. Traditionally, this is put on a pizza stone or pan (hence, Apple Taffy Pizza), but I have a zillion hungry boys at my house today, and they could care less what shape it is, so I went the easy route that fits better in my fridge. Bake this crust at 350 degrees for 25 minutes. Mix filling ingredients together. When crust is completely cool, spread cream cheese mixture on crust. 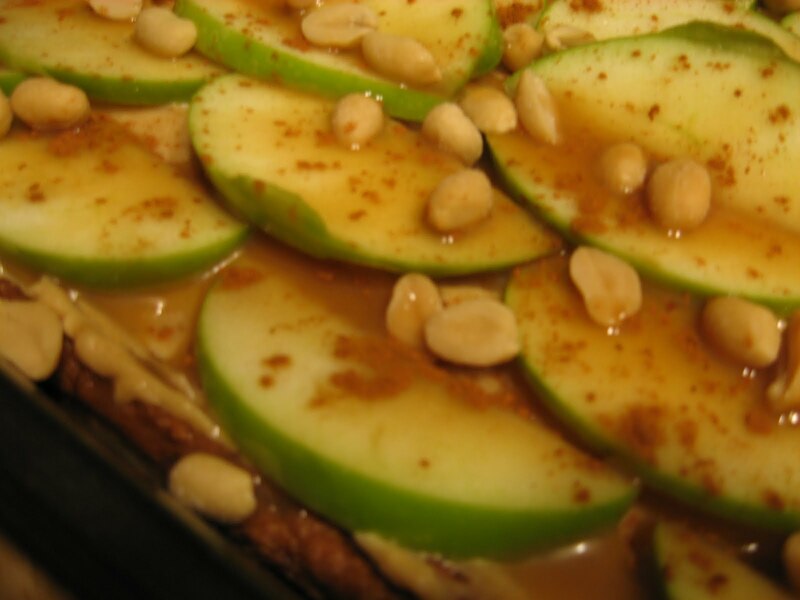 Then layer apples (best to leave them soaking in lemon juice or 7-Up for awhile, to keep them from browning), and sprinkle on cinnamon, peanuts and drizzle with caramel. Keep in the fridge, as this dish is best eaten cold. You can easily make a day ahead of time, as it keeps well for a few days. How about that for a dessert? Well, I need to get moving - boys arriving, still need to make a batch of blueberry muffins, vacuum, and oh yeah, make sure the little man isn't getting into EVERYTHING while I'm trying to accomplish this. I've been thinking of this ever since you mentioned it to me - how amazing! I must make it soon. The seven up is a great tip to prevent the apples from browning too much. Some of my best memories surround different desserts! Mainly my grandma's devil's food cake. Oh wow - I'm a hopeless baker, but this looks GOOD! THAT is dessert. I can't imagine a crumb being leftover at my house either! ohh my that look So good!! I could totally use a piece of this right now!!! we had this at a pampered chef party and i made it for my son's bday. although we left out the cream cheese by accident(it was forgotten) and we decided we liked it even better. 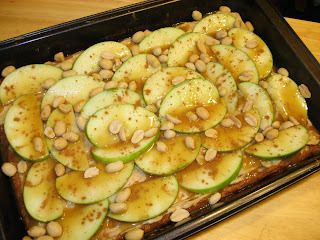 we also crush the peanuts and the texture/taste is out of this world...and the base is sugar cookie dough. a little different than yours, but still good! wow, love the addition of peanuts on this. It reminds me of apple crisp, but healthy! I have never heard of this one before... but I like the idea! Looks amazing! Wow, I'm a hopeless baker, but this looks GOOD! thanx for the post. Wow amazing! I must make it soon. thanx for the recipe, love your blog. I just want to say that i love your recipe, plz post some other delicious recipe, thanx waiting for your next post. I also crush the peanuts and the texture/taste is out of this world...and the base is sugar cookie dough. a little different than yours, but still good! keep it up. Well, I love your recipe, plz post some other delicious recipe, thanx waiting for your next post, keep it up. I might try this at my moms house this weekend. I really thank you for you sharing this recipes. I've made this several times using peanut butter cookie dough rather than sugar cookie dough, and it's awesome that way too. I love peanut butter, so the more the merrier. This is a healthy recipe..I love pizza and apple. Its a perfect combination. Thanks for sharing this awesome recipe. This was so good - I will fix this again and again! There wasn't anything I wouldchange about it! When I'm bored, I eat. Right now, 10 minutes after eating pizza, I'm eating Laffy Taffy and a PB&J sandwich. Can someone help me??? I'm not losing weight by doing this, and that's one thing I"m trying to change. This is such a beautiful dish! I really like it. I will try this at home. Anyways, thanks for the recipe. Wow, what a great recipe!!! Thank you for posting it. Sounds delicious! I will try this at home. Thanks for the share! Love your recipe and must try this at home, thanx. This is what I'm looking for. Awesome recipe! I don't cook good, but I will try the best that I can. Do you have any other suggestions?